I am referring to April O’Neil, of course. As a character, she is the one that has gone through more changes than anyone else in the TMNT mythos. In the comics she was a lab assistant, in the 90’s cartoon and live action movies she became a reporter, in the newer CGI movie she was something like a treasure hunter and in the new animated series she is depicted as a high school girl. Whatever the case, she has always been produced in short numbers as a toy, so I thought it wise to get her while she was still available. 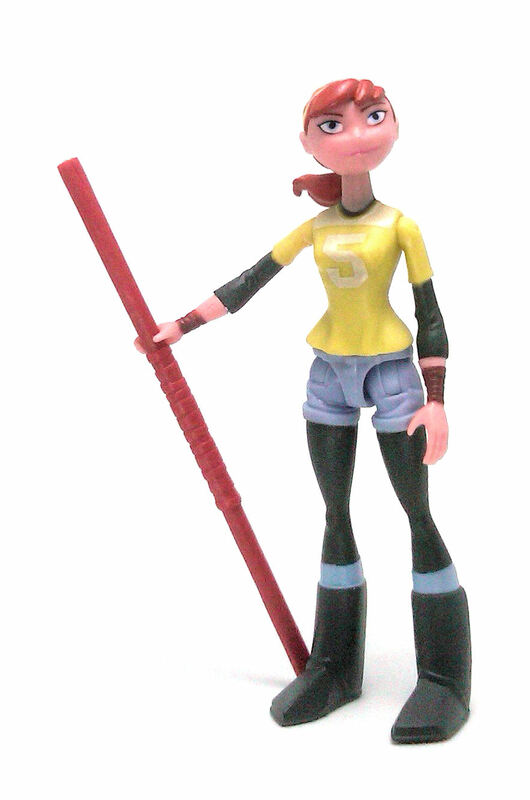 One thing you have to remember is that even though this line was designed to promote the current Nickelodeon cartoon, most of the action figures don’t adhere too closely to the digital models seen on the show, and April is one of those. She is depicted wearing big clunky boots, black leggings, short denim pants and a loose, yellow sports shirt apparently worn over a long sleeved, black t-shirt. The sculpting is very stylized and cartoony to go along with the Turtles but even with that in mind, her face seems to lack definition due to the roundness of it and the almost negligible nose and mouth sculpts. And that’s it. Her limbs are way too thin to house more articulation, but I still would have liked for her to at least have elbows to boost playability a little bit. Which brings me to another minor gripe. 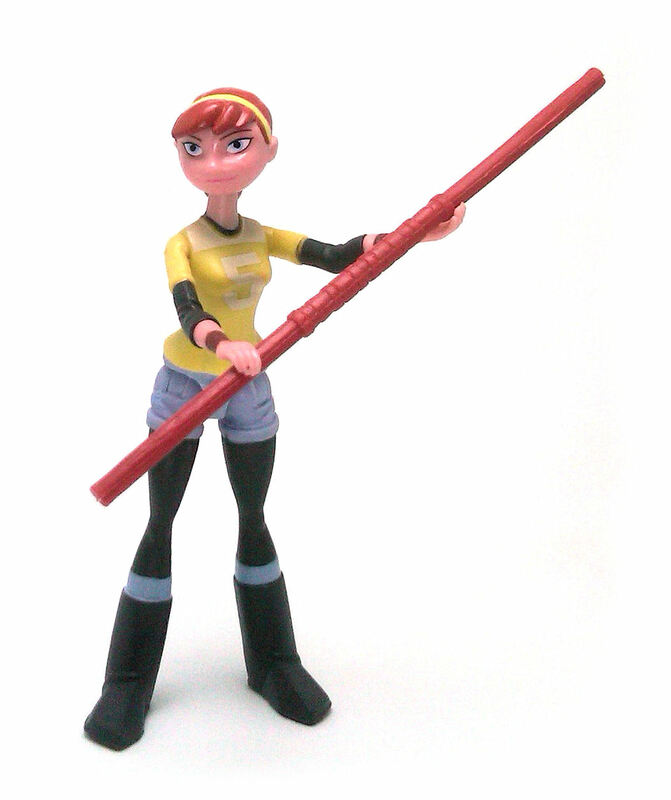 April has her right hand sculpted in a fairly useful gripping pose, but her left hand was sculpted extended, limiting the ways she can wield her accessories. 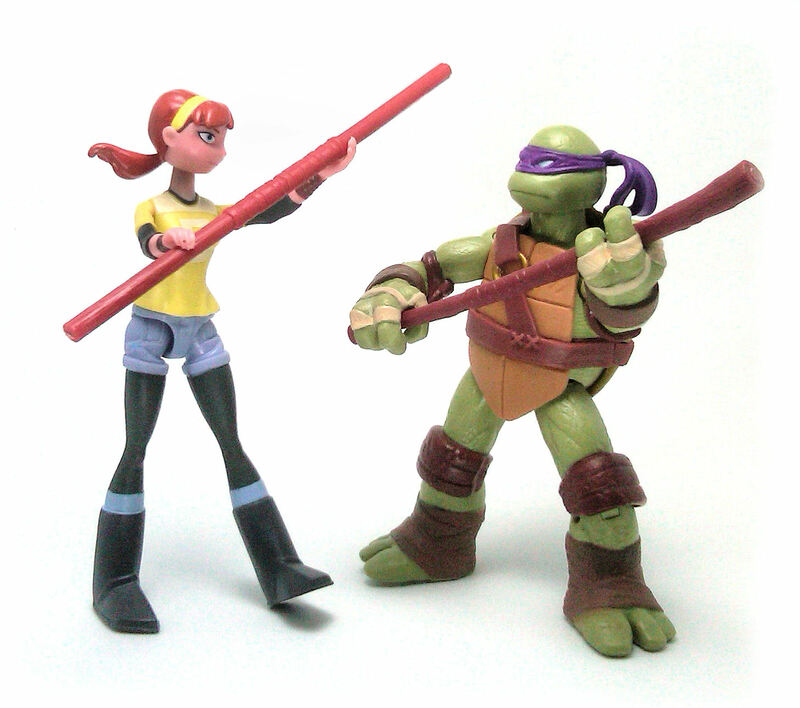 April comes with a Bo staff that is a different sculpt than the one that Donatello came with, as well as a plastic sprue full with extra training weapons. These include a wooden katana, a kendo stick, a tonfa, a couple of shuriken and a pair of what appear to be smoke bombs. The paintjob on April is ok, as most of her pieces are molded in the final plastic color. The black sections are painted neatly, and her eyes are cleanly painted with vibrant colors. Her hair shows some slop at the back, and the separation between hair and headband is a bit wavy, but the overall effect is decent. 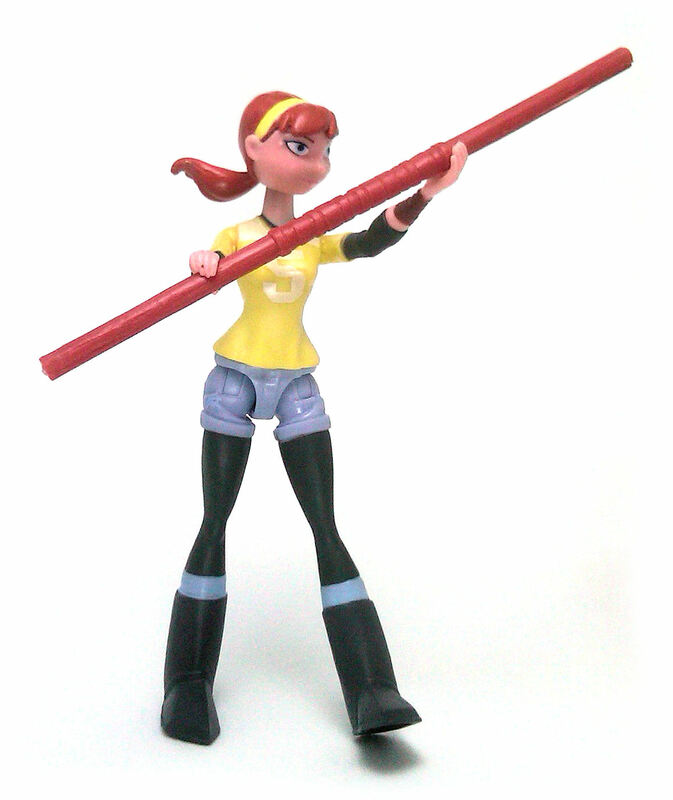 April O’Neil is not quite as fun an action figure as the Ninja Turtles, but she’s still a good addition to the lineup.